Look, we all have to draw the line somewhere. I have over the years insisted that making some things from scratch were just crazy, best left to others, and one by one come around and worse, as if I’d forgotten my repudiation of five minutes earlier like some sort of toddler, extolled the virtues of doing so. Cases in point: Graham crackers, marshmallows, bagels, dulce de leche, pop tarts, rainbow cookies, goldfish crackers, apple strudel, fully from-scratch hot fudge sundae cakes and Russian honey cakes but if you were to suggest I should make my own yogurt, croissants or sushi, despite the fact that I would be delighted if you made any of these things, doubly so if you brought some to me right now, I would probably rather unpack the last box from our last move (two-plus years ago), not even jokingly labeled “Unfiled Files.” Look, we all have to draw the line somewhere. I mean, what’s next if I cross these lines? Milling my own flours? Smoking my own pork belly? Making our own Bailey’s-style Irish cream? Well, actually: yes. And here I go again: But it was so easy! You could and totally should do this at home! I had heard over the years that you could make this at home easily but — and I think this is the fulcrum on which we balance our yup/nope choices to cook things that amply exist outside our kitchens — I wasn’t unhappy with what I could buy (Bailey’s) so why would I bother? Irish cream has always been a favorite cold-weather indulgence, in or outside coffee. I’ve even made french toast with it. We always have a bottle around. But in the last couple years, I’ve found it almost too sweet to drink and I guess you could say we were on a break. 1. Buy or order some bottles. The recipe below fills one of these carafes with enough leftover for a glass for you (you’re welcome). You could also fill 2 1/2 of these small jars which come in packs of 6, something you will not regret. (I plan to use them for milk and cream carafes for coffee when have people over for brunch, something I never have when I need.) I’m sure there are other lovely options out there too, these are just the two I used here. 2. Make this recipe, scaling it as needed. 3. Tie it up with a little ribbon (or thin fairy lights I cannot resist) and a little label and make everyone happy, including yourself, who is not waiting in line at a crowded, stressed-out store but at home on your sofa, holiday music playing and a warming drink in your glass. Tell me, tell me: What are the dishes that you will never, ever cook? I don’t mean “Maybe if you convinced me I would…” I mean, Nope, Nada, Never Going To Happen, Deb dishes. I can’t wait to see where our lists line up. To add a faint coffee flavor: Mix 1 teaspoon instant espresso or coffee powder with the cocoa and then continue as written above, whisking the cream slowly into it. I did not do this; I felt the flavor was much more authentic without it. To make less sweet: Add more cream and more whiskey, 1 tablespoon of each at a time. To make less boozy: Add more cream and condensed milk, 1 tablespoon of each at a time. To make more boozy: You’ve got this. In the bottom of a pitcher, whisk cocoa powder and a spoonful of cream into a paste. Slowly, whisking the whole time, add more cream a spoonful at a time until the paste is smooth and loose enough that you can whisk the rest of the cream in larger splashes. Once all of the cream is in, whisk in condensed milk, whiskey and vanilla. Cover with lid or plastic wrap and keep in fridge for up to two weeks, possibly longer. Serve in a tiny tumbler filled with ice, or splashed into coffee. This looks incredible! Will definitely be making for a coffee add-in on Christmas morning. I will never, ever, completely-not-interested make my own sausage. I know it’s not wildly difficult, but I can get perfectly tasty sausage in our local Italian market, so why bother? I am so with you!! And then my brother-in-law gave my husband a sausage maker for Christmas. Weep! We grew up with a Polish grandpa, who was also a butcher. We lived on his home made sausages and totally regret not learning the art (and the recipe). Gave mum some authentic Polish sausages in the Christmas stocking today! If you sub out the whiskey for mezcal, the cocoa for cinnamon, and coffee for almond extract, you’ve got a boozy horchata version. You’re welcome. You’re a genius! I can’t drink Baileys after a 21st involving too many Irish car bombs (I know, offensive name), but alcohol horchata I can do! Get away from me! By which I mean, want to come over for drinks?? That sounds like a tasty treat. Thanks Patsy. I learn so many great things from so many people by reading this blog. Deb has created a fantastic community of people willing to share ideas. Cheers to Deb! I had a horchata martini this week at a tex mex restaurant that was the most delicious thing I’ve ever drank. The main ingredient was RumChata, MescalChata sounds even better. The drinks menu also said it had Jager, vanilla vodka, 1/2 and 1/2, and cinnamon. and the next day…how’d you feel? You just made my life, you and Deb. Just made the boozy horchata version, with both half a tsp of almond extract and vanilla. Turned out excellent. Reminds me more of tequila cream than horchata. Slow clap. YES. I’m going to be so popular at Christmas this year. I’m in Mexico now; returning home xmas eve. A boozy Horchata is just the thing to help transition to cold and snow! Will be making both of these recipies! It just popped into my mind that I read this comment and intended to try this over a year ago–I’m so excited to make this now! Liz! I’d happily eat whatever layer cake you make!! Filo dough was absolutely the first thing that jumped to my mind. Hard pass. Yes! I learned how to make strudel dough from my mother, who is Croatian, and makes the most delicate apple strudel you could imagine. Strudel dough has such simple ingredients, and is so easy to make, and stretch out! I was going to say ‘never’ to filo, but now you’ve caught me up with the word ‘strudel’. Meaning, now I want to try to make filo-ish strudel pastry! I’ve made croissants, and they were totally worth it! They are time consuming, but not hard. And although I wouldn’t say mine were quite as mind-blowing as what I can get at better bakeries, they were still beautiful, flaky, and delicious and made me feel proud of myself. Agree, croissants are worth it. I made whole wheat croissants, and someone who had lived in Paris raved about them. They are different, of course, not quite as crispy and flaky, but delicious. Ooo which recipe do you use? I just went hunting online and can’t find it. Most so-called whole wheat croissants only have some ww flour, but this recipe was 100% ww. Fortunately, I printed it. Combine dry ingredients and whisk into room temp milk. Mix in stand mixer on medium 4 minutes or knead 5-7 minutes. Proof, covered, 30 minutes. Turn dough onto lightly floured surface, fold it, and refrigerate air tight 2 hours. Roll out butter between parchment or waxed paper to 8×8 inch square and refrigerate. Take butter from fridge and let come to 65 degrees before taking dough out of fridge. Lightly floured surface, roll dough to 14×14″. Put butter in center to look like a diamond in a square. Fold dough corners over butter, overlapping dough. Roll out dough into rectangle large enough to fold like a letter, wrap in plastic, and refrigerate 45 minutes (one turn). Repeat for total of four turns, resting in fridge 20 minutes between 2nd and 4th turns. After final rest following 4th turn, either proceed or refrigerate overnight. Roll the dough into a 1/4″ thick rectangle. Cut and roll (see any online video for instrucs), proof 2 hours until risen and puffy, and bake 15 to 20 minutes at 400 degrees. Use egg wash before baking, if desired. I’ve made mousing amann at home a couple of times. Problem is, then I eat the whole thing. I’ve never seen it in a bakery outside of France. I would have said that I would never make strudel, but you and Luisa convinced me otherwise and I am so happy that you did. Things that I would not bother to make again include tofu, mozzarella, and pasta (as there is a place three blocks from my house that sells fresh pasta and I can only move from the neighborhood if the store closes). Technically, I’ve made fried chicken once, which convinced me to never make it again. It turned out great, but the time it took and the cleanup after made it not worth it. Especially since there are a multitude of places near me that do some awesome fried chicken. Oh my goodness, yes! I just made my own (very boozy) eggnog this year; this is the perfect compliment. I have absolutely zero interest in making my own wine. Maybe things will change if I move to someplace with an enormous cherry orchard or something, but….no. Nothing about home brew alcohol appeals to me, starting with the setup and stopping just short of the finished product. Yes to no interest in home brewing or wine making! Oh, yeah. I am making this one. What I won’t be making is roast suckling pig, lutefisk, or anything else that appears on the holiday table in the movie The Ref. Doh! I completely missed the spirit of the exercise. You probably meant for us to list what we enjoy eating/drinking but wouldn’t put forth the effort to make. In that case, croissants. Definitely croissants. I recipe I will not make? Not hardly since you pretest everything for me! I cannot tell you how many recipes you have made accessible to me. On the other hand, I do not eat mammals, so those recipes are safe from me. Never making: I can’t even answer this; it turns out that I’ll attempt almost anything given the right wild hair. 10pm seems to be the usual flashpoint, which is horrible timing. The first time I ever made a stromboli at home, it was at 10:00pm because my husband questioned whether I could make one as good as his favorite pizza place. It’s like the recipe testing witching hour. Oh, man – what inspiration! I have leftover butter chicken in the refrigerator and a tube of Pillsbury pizza dough (I know, I know, I should be ashamed to admit such a thing). I could make a butter chicken stromboli! w00t! I’m going to do it. Watch this putt! I would never make penne alla vodka or if ur from Jersey like me – “penne va-ka”. I dunno why. I think I just like to keep that an order out/in thing! Bahaha!!! I was making biscotti at 10 pm last night! Too bad I didn’t yet know I could make my own Irish cream too. I make croissants for Christmas breakfast but I will never make the leap to making my own puff pastry. Things I won’t make: croissants, beer, cheese. Jam is also on the warning list because of the absolute faff of sterilising jars, but I haven’t broken up with it completely just yet. I wash my jars in hot soapy water and then put them in a 200º oven on a baking sheet. I pull each jar out with tongs and fill. Much easier than boiling water. I just keep the lids in boiling water. I’m scared of canning too, so I make refrigerator jam. It keeps quite a long time and it definitely tastes better than commercial jam. I just made a batch of strawberry jam as strawberries just appeared at the Farmers’ Market. I live in Los Angeles, CA. I also hate the mess of water baths. I use the dishwasher or oven to sterilize. Some refer to as “French method”. and the french method for sealing. Here’s an example on one method but also look for “French canning”. What are you tips for adding a hint of peppermint? Start with 1/4 teaspoon peppermint extract, add more, 1/4 teaspoon at a time until you get the taste as you want it. Tortillas. It *might* be different if I had a press, I dunno. Attempted it once, it took time & effort to make something no better (actually worse) than storebought. I can’t be bothered with corn tortillas at home (I also do not have a press) but i love making flour tortillas from scratch when i have the time. it’s a bit tedious because i fry them individually, but they are wildly better than store bought! So many places have the parbaked ones now, where you just finish them up in a pan, that I just use those. Thank you for the tortilla recipe! I used to have a press, but I broke it. The pie plate works better anyway. This looks delicious! I love Baileys but we have not been able to drink it since losing the ability to digest dairy. Which leaves me to ask the annoying “how can I modify/can I modify” question. Because it would be wonderful to have a dairy-free version, but I have yet to find a good substitute for condensed milk (almond or soy creamer work pretty well for cream). Suggestions? In terms of things I’d never make – the list is too long to post since I can barely make my own pie crust! Much more of a cook than a baker. I did find condensed coconut milk at our grocery store. I wonder how this would work? My (adult) daughter is allergic to dairy and thus, has never been able to enjoy Irish Cream. I’ve found that cashew milk is my favorite non-dairy substitute when I need something high-fat (especially since I’m not a huge fan of coconut). Would work well here, I think! I’ve consumed it many many times and it’s a winner! I was thinking about this too. Coconut milk would be the easy swap for cream, condensed milk is tricker, but can absolutely be made at home. (It’s what we do for this homemade dulce de leche, we just go steps further to caramelize it.) But I do think that concentrating coconut milk that much would be too intensely coconutty, unless that’s what you’re going for. There are a lot of recipes on the web for vegan condensed milk, though, I’d start with one of them. Thank you! I should have searched vegan condensed milk! This is helpful and might be an answer to my pumpkin pie dilemma too. This year I swapped my sweetened condensed milk for a can of coconut milk. Kept everything else the same and it was perfect and delicious. Kids and pumpkin pie loving father approved. So easy! Trader Joe’s has a coconut cream that might work. I use it to make vegan whipped cream. I have the same problem with dairy and make a pumpkin pie that no one knows until they are eating and raving about it that it’s actually made with tofu. My recipe is the old hard-copy type but there are many similar ones online. I hope this helps solve that dilemma. Cheers! Erin – oat milk is the way to go. I made an amazing pumpkin pie this year by reducing oat milk by about 1/3 and it was amazing. I like oat milk because it doesn’t have much of its own flavor. Followed the pumpkin pie recipe on the back of a can of Libby’s using oat milk instead of condensed and doubled all the spices as I do. Yeah – I’m not one who will make their own alternative non dairy milks – even though I know it’s easy – mostly because I am not the kind of person who thinks ahead like that. Plus one can buy a case of oat milk and have it on hand forever. I found some coconut condensed milk at my local Grocery Outlet. Haven’t used it yet, but was thinking of flan. Maybe Whole Foods would have it? Because my husband is lactose veg, I follow a number of vegan pages for recipes without meat and eggs. They swear by condensed coconut cream and have some interesting recipes for it. It is on my list of things to get around to. Coconut creme makes it very coconutty and it’s called coquito; a gift of the island gods when made with white rum. 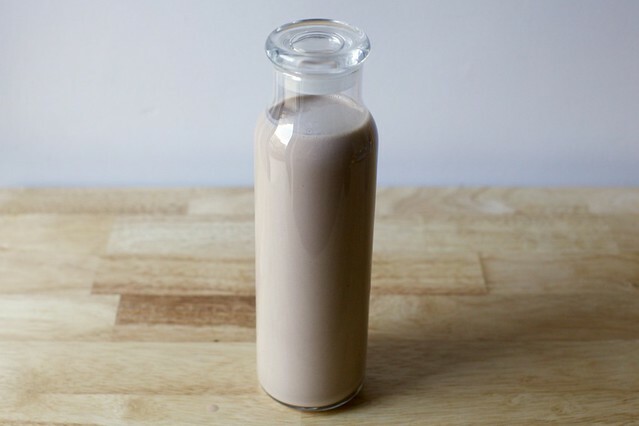 I have made a vegan version of this by making my own cashew milk at home. Soak 2 cups of raw unsalted cashews in water for 24 hours at room temperature. Then blend on high with two cups of fresh water for 3-5 minutes. Strain through a milk bag and you will have a pretty thick cashew milk/creme that does not have a strong flavor. If it is not think enough for you liking, you can reduce it to your desired consistency on the stovetop. I then used maple syrup as a sweetener to make up for the lack of sweetened condensed milk. Hope this helps! Horchata was discussed above as being dairy, but I have always known it to be soaked rice and almonds. I have not made it, but I would expect that there is a good Diana Kennedy recipe out there. There is a soaking overnight step, but I do not think that it is a lot of active work. Erin, Not sure if it is available in the US, but when I was in the liquor store here in Canada a couple of days ago they were offering samples of different varieties of Baileys and one of the options was a dairy free one made with almond milk. I’ve bought sweetened condensed coconut milk at the grocery. Brand name is Natures Charm. My homemade version is somewhat better, based on coconut cream. I don’t drink alcohol, having abused the privilege early in life. This recipe with homemade condensed coconut milk and no booze is actually quite good, although it probably defeats the purpose. 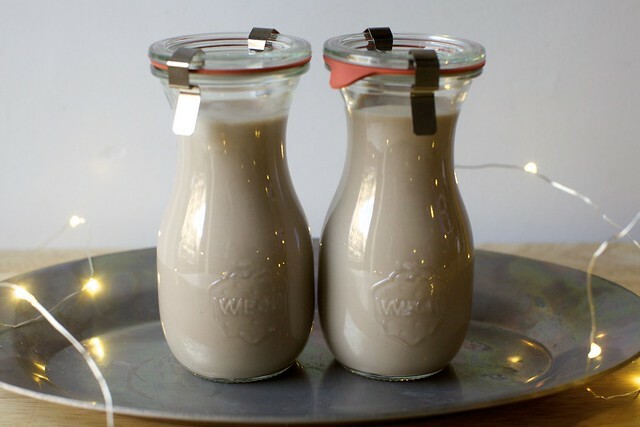 There are a number of vegan Irish Cream recipes on line. I don’t remember the sources any more, but I used a combination of 2 or 3 of them and came very close to Bailey’s. My vegan friend had been moaning that she couldn’t have Bailey’s anymore, and practically had raptured when I gave her the homemade vegan version. Never EVER?? Something called Swiss Steak that my Mom used to make in the pressure cooker. Beef slab (it wasn’t steak) and tomatoes with a side of scary story about what can go wrong with pressure cookers. Served over buttered noodles. It was tasty to someone, I’m sure. It’s just SO not my thing. Getting a little icked over just thinking about it. Plus PRESSURE COOKER. Sounds like something my father would do. He called it “mish-mash” and it was whatever he could get his hands on in the fridge thrown in the pot with some rice and a few packets of ramen seasoning. It had the consistency of pudding, kind of. Probably a really wet risotto, but everything was mushy. This is also the reason why my mother took a cooking break for a few days and then never took a cooking break again. My dad made the same thing and called it goulash. 2 versions: tomato sauce or cream of mushroom soup. “Swiss steak”. Boy did that bring it all back! Shallow pan, piece of round steak smothered with a can (or two, depending on how big the piece of meat was) of stewed tomatoes. Simmer until meat was really tender. My mother made this fairly often, and my Dad and I liked it, especially with mashed potatoes. This sounds like my Italian husband’s family pizziola recipe, which is pretty amazing. Brown a chuck steak in olive oil, cover with crushed tomatoes with dried oregano and basil (maybe some garlic? I can’t remember) and cook for two-ish hours. Served over pasta. It sounds like what Swiss Steak was trying to be, but missed badly. I can’t see myself ever making pasta. I’ve made puff pastry, sourdough bread, yogurt… But I seem to have some sort of mental block about pasta. My husband adores making pasta, but honestly the mess is not worth the result! Homemade yogurt is super easy! It is! I quite couldn’t believe it the first time I made it. I would never make Peking Duck. It’s delicious, but best left to experts. However, I adore taking the carcass home and making duck stock with a generous side of duck fat. My dad has been making this for years- but he adds an egg beater and coconut extract to his. He also uses chocolate syrup rather than cocoa powder. I will never attempt to make gnocchi again. And whenever I see someone making filopastry on tv, that seems nuts. Hard enough cooking with store bought..
Yup. So right. I could’t say never to many things, because I just might someday. But gnocchi. Definitely not going there again. Maybe tortillas and croissants as well. Heard Tofu earlier. Never thought about making it. Kimchi seems to scare me, but I also feel like it will happen someday. Got it: Will not be making original soft pretzels with lye. I’ve had a gnocchi disaster myself– can’t imagine ever having another attempt! Learned how to make gnocchi last year in a cooking lesson in Italy. Best darn gnocchi we ever ate, including in restaurants in Italy. Have only made it twice since… but look forward to making it again. I think it depends on the recipe! I have wanted to make French macarons bc I love them and they tend to be expensive, and when I looked into it I realized why: almond flour, and pretty hard to get the science down to get them right. I would probably never make taffy either, or sourdough bread. You don’t need a whole lot of almond flour to make a batch–and there are brands that cost less than others. So the cost isn’t too high per batch. I had a “successful failure” on my first batch, and subsequent one’s were surprisingly successful (after searching every hint available online). As my cousin’s husband pointed out, though “sounds like the whole process is three days, yes?” He’s right. Aging eggs overnight, making them, and then letting them sit for a day prior to eating = three days. Picky little suckers, but honestly very satisfying. Even imperfect they taste great! Yum! Also I definitely want to try a horchata version of this. I cooked fresh fava beans once, and I actually would do it again, but only if I could trick someone into falling in love with me and then make them help me peal the little jackets off each bean. I made croissants once from scratch, though…and would totally do it again. I’ve been wanting to try this forever! Tamales. I have heard it is a giant mess, and authentic ones aren’t that expensive. Though with a step by step guide from my favorite food blogger, I might be tempted…. I just made them by myself for the first time, and found it surprisingly easy. I ran out of corn husks though, and probably used the wrong masa, but such is life in away from my beloved Mexican markets. I’ve made tamales, and the most time consuming part was homemade masa. Only to find out later most people buy the ready made masa! So, no more masa from scratch. In my experience, the fun of tamale making comes from doing it as group. We’ve thrown some awesome tamale parties, where people bring different fillings, and the reward is bags and bags of tamales to stock the freezer with. It’s a mess, and requires a lot of stove space (an outdoor grill can supplement), but oh such fun! I wouldn’t make the usual tamales, but the green corn (fresh corn) tamales I used to get at Food Conspiracy in Tucson were amazing, and I’ve never found anything close. (Trader Joe’s are a very pale comparison.) It was a huge mess, and has to be done in sweet corn season, but heavenly. This looks totally yummy and I would have made this for Christmas if we hadn’t just bought a big bottle of Baileys for just that occasion. However, I am horrified by the price of the little Weck bottles on Amazon. Six of these in Germany cost €5.90, translating to $6.16. Not more than FOUR times the price ($26.25), even if you include the rubber rings and grips (which cost cents)! OK, now I am interested and I have just sent off an email to the Weck people to find out how much the postage would be for these bottles. I’ll let you know their answer. Please open an ebay store and report back here as Amber suggests!! Thank you! an idea that drives me crazy is to have to serve several hot dishes at the same time for guests – just the idea to take care of the warming/cooking of each of the dishes and that they have to be ready at the same time. so what i mostly do is either cold dishes (in summer, when its hot) or a long series of single dishes i have the nerve to take care of. Never making at home (again, in some cases): certain ethnic foods, especially South Indian! Ethiopian and Asian. I tried to make a South Indian feast once and spent TWO FULL DAYS on prep and still couldn’t complete two-thirds of the menu. Plus I was so exhausted and burnt out that I didn’t enjoy a single bite. I’ve learned that the restaurants that specialize in these cuisines are really the best option for me. My husband mostly cooks Indian. Most of the feasts are the work of multiple people. That is like trying to replicate Thanksgiving by yourself when you aren’t familiar with it! If you do ever try again, seriously it is okay just to make one or two things. How interesting – while I’m hardly a South Indian cooking expert, I have made a lot of recipes over the years (mostly guided by Maya Kaimal) that I LOVE, and the defining characteristic to my mind is how easy and quick they are! I wonder if we’re defining “South Indian” differently. I’m talking mostly Keralan food: sambar, idli, thoren, aviyal, kichadis, and pachadis. If you’re willing to give it another go (and it’s SO delicious), I really recommend her cookbooks. You’ll discover it’s easy! Dosas are South Indian and time consuming to make. Although I learned how in an Indian cooking class, I’ve never made them on my own. A local Indian restaurant makes a version that I don’t care for. I do make Indian breads at home, but nothing fried because if it is cooked in deep fat, I don’t make it. The best way to have homemade Indian food is to gather fans of Indian cooking and have periodic dinner parties where each person brings one dish. Such fun. Hmmm, I’m sure I’ll need to taste as I go along to make sure I get the proportions j-u-u-u-st right – hah! Preserved lemons probably never going to happen! Preserved lemons are the easiest things EVER! I hosted cookbook author/memoirist Kitty Morse at my library a few months ago, and she demonstrated how to make preserved lemons. I went home that night and had two jars ready in about 15 minutes. They are now hanging out in my fridge, waiting till I have time to make a lovely tagine. Oh my goodness!!! I think this looks soooo good!! We might not have it in those pretty bottles, but we’ll definitely be making and enjoying this!!! Great recipe, and I hate to be a party pooper, but–is there a way to reduce the fat of the heavy cream by substituting half and half, or whole milk, or…? I was wondering this too. If anyone tries making it with a lower fat cream, I’d be interested in hearing the results. Less thick if using 18% or 10%, but tasting just as luscious would be my guess. This most likely is not as luscious as Deb’s, but it works for me! Caneles – every time I look at a recipe I’m shocked that they aren’t easier to make. I know you said on IG they’re too hard but… please??? They’re my fave and I have a hunch you could totally crack them! I had an Irish Cream milkshake somewhere once–I want to try pouring a low booze version of this (freezing issues) in my ice cream mixer. It is basically what I use as a base. And low booze would make it soft. Probably not crossaints or bacon. That being said, I took a charcuterie class and made salami and it was easier than I thought. Really fun. I was looking at your marzipan, didn’t think I’d ever do that, but I might. I’m like you, I prefer to make most things from scratch. I find sourdough daunting, but have made other breads successfully. Chocolate from cocoa beans, probably not. I will never make anything that involves a pressure cooker. My mother had one and it made this hissing noise that made me think it might explode. I will never make sauerkraut. My parents made a big barrel of it every fall and it smelled hideous. My mom used to bury unpeeled apples amongst the cabbage and then jump for joy when she would encounter one while scooping out the kraut. That’s the end of my never list. Anything else is fair game. Hi Charlotte, I don’t want to change your mind, but they make pressure cookers that don’t HISS loudly now! I have a quiet model and it is such an improvement! One of my friends has a new pressure cooker that she raves about but I can’t shake those childhood fears about it blowing up. I know it’s silly. I was always more afraid of the pressure cooker than I ever was, or ever will be, of the monsters under the bed and in the closet. Boo! I totally feel you went I first got married at the ripe age of 16, I inherited my grandmothers pressure cooker and I blew it up trying to make pinto beans!! Needless to say I have never had another one nor made beans again!! My little daughter was in someone else’s kitchen when her pressure cooker exploded. She had a couple of small burns, but thank God no one was seriously injured. This looks fabulous! Which cocoa powder did you use? Dutch-processed prob not a good idea(?). Doesn’t matter — there’s no chemical leavening reaction here. and buy some more. Meringue is a no go, but I might get brave some time. Any chance of a good old fashioned egg nog recipe some time? This recipe is very similar to the old fashioned egg nog recipe I used to make as a bartender many years ago. Give it a (pun intended) shot! Seconding the never making deep-fried stuff — I’m way too scared of starting an enormous grease fire and burning the house down. That said, I’ve made croissants, fresh pasta, and croquembouche (all yum), as well as gnocci and mozzarella (massive fails, but would try again). Basically, no bubbling oil? I’ll give it a shot! My never-would-I-ever list is pretty short: anything cultured (my mother instilled a lifelong terror of incorrectly cultured yogurt, which taints by association cultured cheeses and kombucha, though I am oddly blase about sauerkraut, sourdough, and home brewing); anything deep fried (this one was my father’s fault with graphic descriptions of the defensive potential of boiling oil in medieval warfare), anything involving a candy thermometer (because hot sugar scares me). Otherwise, I’m game for anything with the right motivation – croissants were satisfying, puff pastry was empowering, and butchery makes me feel like a superwoman. And all of my grandmothers would die of embarassment if I couldn’t can fruit and vegetables, make four kinds of pickles, and turn out endless pots of jam and jelly, so I can (pun not intended!). I love kombucha. It’s so expensive so I should really start making it but I’m terrified of the mother! Sounds delicious! I’ve made cream liqueur before but the recipe called for creme anglaise, it think this version would keep better. Ice cream, sadly, is out because my husband is strongly discouraging me from buying any more single-use appliances. I won’t make butter because I don’t need more excuses to eat more bread, besides, if I were to buy cream nice enough to make nice butter I might as well just buy the butter. You can totally make croissants! They were far easier than I expected. If you can roll dough you can make croissants. Making the butter packet gives me not fur since reason. The first tune I tried, I didn’t do the folding/turning correctly at all and try were still great. Do you think this would taste good without the alcohol? I’m pregnant, but this looks delicious! Maybe you could try some of the other extracts? I went through that last year… I never did it, but I considered cooking the alcohol off bourbon because I missed it SO MUCH. (I would occasionally take one tiny sip from my husband’s glass. Like, a drop to the tongue.) It’s a thought. Seriously, I make it in the crock pot and it takes forever, but it’s unbelievably easy. I know, yogurt is sooo easy. And is very hands off. Sooo good too. On my never cook list: Croissants. I actually made these once…with two other people…over the course of 48 hours. They tasted good but not as good as a bakery and wayyyy too much effort. So never again. This irish cream looks easy and tasty though. Pad thai! Absolutely no point in trying to recreate it with all the ingredients it takes to make truly delicious. Really? Plated did a version which was super easy to do and basically boiled down to the secret ingredients being bok choy, shredded carrots, gouchujang paste, and tamarind paste. Which yes, are a bit of a pain to buy (Amazon, FTW) but once you have them they keep FOREVER. Plus now we’re addicted to gochujang paste on/in just about everything. And it turns out that mixing it with warm water, fish sauce, and peanut butter is the ‘secret’ to the proper taste for quite a lot of Thai food. I’m with you on this completely – made it from scratch once and will never do it again. Way too many ingredients to purchase, plus with an electric flat-top stove and no wok, it just didn’t quite turn out right. Plenty of thai restaurants can do it good enough to satisfy the craving when it hits! We make something similar! Only it’s eggs, heavy cream, jameson, and just a tablespoon or so of chocolate syrup. It’s TO DIE FOR. I tried this recipe, and got quite a bit of cocoa sediment at the bottom of my bottles. Next year, I’m trying it with chocolate syrup! Thanks for the tip! Can’t wait to make this as my office gift this year! Your recipes are always great and the stories which accompany them either cause me to 1) giggle or 2) groan in sympathy. Absolutely no interest in grinding my own meat, making any type of laminated pastry or doing sugar work of any kind!!! Croissants, puff pastry, filo, sushi, dim sum (I’m pretty sure it would take me days and wouldn’t taste as good as at a restaurant. ), molded cheeses like cheddar (I make ricotta and paneer. ), deep fried food, molecular gastronomy (Only because I don’t have the tools.). Deb, you should try making yogurt. It’s easier than lots of dishes you post here and tastes better than store bought not to mention it’s less expensive. All you really need is an instant read thermometer. If you want my recipe email me. What don’t I bother making? Tamales, Tortillas, croissants, filo dough. Gnocci. I’ve at least attempted each, but the hassle/results ratio was way off kilter for me. No way I’m making kouign amann or other such fiddly pastries. Such things don’t keep well enough to justify the effort expended. Egg Rolls, pot stickers and those fried cream cheese whatever you call them are delicious and entirely too irresistible. Most barbecue? I love it, but would just as soon let somebody else reek of wood smoke to bring it into existence, and I hate the flavor/smell of charcoal lighter fluid … . I do make my own lavash crackers, and a particularly fiddly sugar cookie with maple sugar in it. Both are kind of a pain, but the end result keeps well and tastes fabulous, so they’ve stayed in my repertoire. I know it’s easy, but if I knew how much cream and sugar I put in, I would never eat it. Ignorance is bliss for me in this case! When someone else makes it, the calories don’t count! I guess we like challenges because the ATK’s DIY cookbook is fun for us. But while we’ll try almost anything once, if it’s not cheaper, better or tailored to our taste somehow, it may not get a second go around. Canele and torrone are two memorable ones better left to the experts. Puff pastry, sushi, and crackers. Things I’ve made from scratch that I found overrated, or at least not worth the effort: pasta and tortillas. You’ve made me so happy! I’m concocting this asap!! Deep frying. Between the mess, the fire hazard, the cost of all that oil. It’s literally cheaper for me to order it in a restaurant. Something I haven’t seen here: organ meats. They stink. I have never smelled them cooking without being grossed out by the smell, even without knowing what they were. No liver, kidneys, hearts, etc. Oh, that wee noodle and her AMAZING CURLS! Alas, hat season is not good for those of us with stick straight hair either …….. It just gets straighter under a cute or not cute knit hat! AND THE STATIC, good gravy! Not enough Static Guard in the world for the brushes to fluff it back up or combat the flyaways! Never making at home: anything canned, like summer veggies. Hot steam and pressure, no thanks! This looks absolutely yum! Things in will never make: anything deep fried. Mostly because I’m reasonably sure I would hurt myself. Despite the fact that I worked as a pastry chef for a while and in fact used to make them every day, I still somehow think of myself as a person who would never make my own croissants. That said, I would really truly never, ever, ever make my own pho. I live in Seattle, where better pho than I would ever be able to make is on every other street corner for under $10. It’s just never gonna happen. Never say never. Made my own in a crock pot, no less and it was fantastic. Not the same, but really really good. Things I have made and would not do again – flour tortillas. Things that are good to make yourself for a large crowd – sushi! It is so much less expensive and actually quite a fun activity to do with friends. Things I would never even think of making – sour cream, puff pastry and anything too small and labor-intensive (gnocchi, breakfast cereal like cheerios etc). My elderly parents made their first sushi tonight and really enjoyed it! They sent me pics of their very deformed rolls but even in a falling apart state it looked very delicious. Tastes the same no after how it looks so it’s inspired me to try it for myself! I will never make anything that involves shelling an uncooked lobster. There’s a reason to boil it. Looks pretty good. I don’t think that I will ever make cheese, sure, homemade mozzarella looks good, but that is where I draw the line. I am never ever going to make my own chicken tikka masala. I live in NYC ferchrissakes! Despite the fact that I have at least three recipes arichved – I read them and think maaaaaybeeee….then I remember I can order it any damn time. Unless I end up moving somewhere with no Indian restaurants. Which is seriously a thing that makes me think twice about moving away, even when it is only 20 degrees outside! Try looking for crock pot recipes. Those are both easy and tasty! I make it every month. Tofu. Never ever will I make tofu. Especially not the deep fried tofu puffs that you buy in the freezer section of Asian grocers that go so well in laksas and other soup curried things. Yoghurt, however, is a piece of cake. Bring 1L of good quality full fat milk to the boil and simmer for 10 minutes or so. Cool to lukewarm. Thoroughly mix in about 1/4 cup of good quality yoghurt with live cultures. Keep warm for 8-10 hours. Refrigerate before eating. Enjoy but make sure to keep 1/4 cup for your next batch. Repeat ad infinitum! Hannah: I make a crockpot version of yogurt, using 1/2 gallon of milk. Your’s sounds much easier. I found a food blog wherein the writer/cook tested different amounts of starter. She found that 1 teaspoon–yes, it was hard for me to believe too–yielded the thickest yogurt. I tried it and she was right. That is all I use when I make it with 1/2 gallon of milk. I love homemade yogurt and so do all my friends! Tamales. My mom always made them from scratch when we were growing up and my sister and I would help fold and tie them. Just the thought of all that work, no matter the delicious outcome, is enough for me to say “pass”. This made me laugh, as I ate my words not two weeks ago saying the same thing! During the summer, watching the great british bakeoff, one of the weekly technical challenges was to make 12 jaffa cakes. Now, I must confess that jaffa cakes are one of my personal faves, and I am generally in favour of home made vs shop bought. However, I did think, the shop bought ones are perfectly delicious, why would you go to the trouble of making these?!?. Then two weeks ago I get a text from my mum saying she made jaffa cakes and saved me 4… now I happily and wholeheartedly eat my words, they are definitely worth making yourself. Much, much better! Made this with Jim Beam, very good recipe! Really glad to hear this! In my holiday rush, I totally grabbed Jim Beam off the shelf instead of Jameson. Whoops! This looks fantastic! It’s on the list for next week. In terms of what I won’t make, well, divinity is high on the list. I’ve made bacon, croissants, sausage, and lots of other things other won’t make. But I don’t like divinity and I won’t make it. I would like to make pancetta, though; regular bacon was so much fun. I’ve seen recipies for Bailey’s, but never tried them. Now I realize why. I wasn’t sure it would be really good, really worth the trouble. But I trust you, if you say its easy, it will be. And thank you for giving us the brand of whiskey you used. Most of the time, it’s just “use a good” whiskey or whatever. Since I’m not up on whiskeys, that’s so helpful. It took me more than 5 minutes, maybe 10, lol. It’s very nice, creamy, barely chocolatey, smooth, I will be making it again. I think this is the holiday present solution. I will never make Bar B Que. I live in Birmingham AL. I will never make Japanese food. I live in Birmingham, AL. I left NY in 1989, and I have had little since. I am busy mastering the art of Korean cooking. Superlatives are inadequate–I am a huge fan, Deb. I promised someone Homemade Irish Cream. Today. I’m going to make this with the Canadian rye whiskey that I already have in my pantry. I’ve spent way too much at the liquor store already this month to buy another bottle. And it’s snowing and I’m too lazy to go back out. I’ll follow up with the results. If it’s drinkable I’ll call it Prarie Cream. I used mostly Meyer lemons, but I will use more “regular” lemons next time, as I’d like more distinct lemon flavor. The zest (yellow part of the peel — no pith) is all you use. Steep the peels in Everclear for however long you like; some say a week, some a month or more. I did 3+ weeks. Then combine milk (or combo of milk and cream) with sugar and vanilla bean (I used clear vanilla flavoring instead; strain if you use the bean/seeds). Let milk/sugar/vanilla cool completely – like 12 hours, if necessary. Strain the peels from the Everclear; discard peels (alcohol will be yellow-tinted). Combine milk mixture with alcohol. Refrigerate. Amazing. I had no idea it could be made. It never occurred to me to Google recipes for it. This is great to know. I only looked to see if was available commercially in Canada. I love the stuff. I’ll try this in the new year. Thanks ever so much. You just solved my no-time-to-cook issues for tomorrow’s book club potluck. Thank you, and my book club thanks you, too! I’m with you on the not making croissants at home – I feel like the time, effort and expense of ingredients wouldn’t be worth it as my homemade effort probably wouldn’t compare to what I could buy. Anything deep fried also intimidates me. I do like a random baking project though. I roped my husband into making a croquembouche one Christmas when it was just the two of us, despite never having attempted choux pastry or pastry cream before. I’m intimidated by, but someday still want to make my own sourdough & ginger beer. 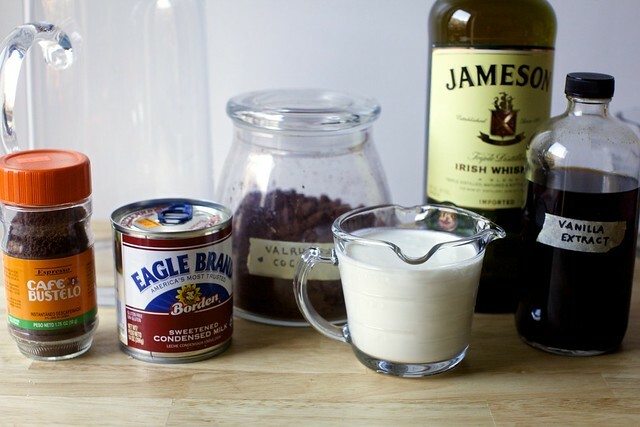 Plus you’ve totally convinced me to try making Irish Cream now, well, once I’m no longer pregnant! PS. You should totally make your own sushi! It’s easy, no weird really weird ingredients or specialist equipment required and you have total control over the fillings. It’s easy enough to do with kids where they can make their own preferred fillings. Sort of the equivalence to making your own pizza, even though you can buy great pizza elsewhere, but even easier, I think! So wrong it’s so right. And why the heck did I happen to have every ingredient for this with a snow storm coming? Because it is my lucky day! I haven’t been brave enough to try them, but I would totally give croissants a shot if I had an easy-to-follow, trusted recipe from you, Deb! And brunch guests to eat them all up :). Things I actually wouldn’t ever cook: animal body parts (offal, chicken feet, pig/sheep heads, etc. ), filo dough, chocolate from cocoa beans, anything deep-fried (I just can’t with the oil), homemade parathas, anything too fishy (lutefisk, gefilte fish, smoked fish, etc. ), mussels, lobster, crab or clams – my husband’s allergic and I’d be freaked out, specialty noodles (udon, soba, pho, etc)…I think that’s my list. Happiest of holidays to you and yours! If you’re up for making croissants I would highly recommend the recipe from the Bourke Street Bakery cookbook. It’s a wonderful Sydney bakery that David Lebovitz has written about. Their recipe is best spread out over a couple of days but its doable and they’re truly some of the best croissants I’ve ever eaten (just make sure you have friends and family around to help eat them haha). Never going to make from scratch? bleu cheese. *insert prayer-hands emoji here* You’ve done it once again Deb. And there was much rejoicing! (said in a Monty Python tone). Nope, not ever going to do it list: homemade phyllo dough, almost anything that would require a deep fryer, my mom’s chicken cacciatore (though that’s more of a personal no-no; it wouldn’t be the same!). Ran out to grab the ingredients, and whipped this up in 5 minutes to bring to friends hosting a solstice bonfire tonight. It’s SO GOOD. You are a genius. I will have to try this. I always said I will never make Aquafaba Meringues: https://cookandenjoyrecipes.wordpress.com/2016/12/16/ess-easy-aquafaba-vegan-meringues/ Never say never, I just made them today, and may I say so myself, it’s super awesome. Also said, I will never made Marshmallows, regular or vegan. Well that’s on the to do list for tomorrow, just have to go and get a candy thermometer. Well, why all the vegan stuff if I am not vegan. Well my son and family = vegan and I am the one to make the Christmas dessert this year, so now I am adjusting and adapting a recipe which I would have made if I had to make a regular Christmas dessert, so now I am just doing it vegan. Whole foods/most coops carry Dandies vegan marshmallows if u have a store by you. They are excellent! Yes, I DID just make this in 5 minutes! It is delectable. Thank you! Two things, one’s a tip and one’s a clarification… My cocoa caused little lumps (I don’t think I whisked enough before adding all the liquids) so I just poured it through a mesh strainer which totally worked. Also, it makes a little less than 3 3/4 cups because the condensed milk isn’t 14 oz. by volume but by weight, so it makes about 3 cups. The only reason I know this is because I pre-measured the size of the bottle I wanted to store it in and 3 3/4 cups would have overflowed it. The final recipe fit PERFECTLY in the bottle 😊happy sipping! I doubt that I’ll ever bother with croissants or puff pastry. And also doubt I’ll ever cook another goose. We had one for Christmas dinner a few years ago, because I’d never cooked a goose before. It did make absolutely the most delicious gravy I’ve ever had, but was not worth the effort or expense. Deb, I just made this and chocolate chunk cookies. Then proceeded to dunk a warm cookie (okay, it was two) in a tumbler of this. Talk about good. And, yes, it was 10:30 p.m. when I started. Ha! We did the same thing! Deb, you continue to just be too awesome! I would have never thought to make Bailey’s, which I have as a “special coffee” occasionally in the evenings. Now, I will be making this today, after I go buy a bottle of whisky! We will see if I share it or have it all to myself! Thank you!!! I made a French country pate with pork liver once–that’ll never happen no more! Though I might try for a duck mousse pate if I knew where to find duck livers….any suggestions? Julia Child has a fabulous chicken liver mousse that you ought to try. Whole Foods is a good source for healthy chicken livers. Chicken liver is also cheap, as compared to duck or goose. You’re supposed to soak the livers in milk for a few hours to reduce the stronger livery taste. My husband has a Serbian dish of pan fried beef liver (slab) slathered in onions. It’s one of the few healthy things that he likes, but I have to slather it in something (bacon sautéed chard vs mustard?) to get it down. Veal liver is milder, but I have to special order it to get it at all. Oh yes! I love David Lebovitz’ version and make it often with livers from Whole Foods. Used to be able to buy a locally-made duck mousse pate that was outstanding, but no more. Would try it myself if I could find the duck livers. I’m in the midst of a terrine right now. Did not sufficiently plan ahead so was not able to get pig liver from our local organic farm. I’m subbing chicken livers and playing with a recipe–base of pork shoulder and pork belly for fat in a hand chop, plus some chicken livers and chopped duck breast, then strips of duck breast and more chicken livers in the center, with some pistachios for interest. I hope it turns out! I will never make puff pastry, dufour is my friend… i do want to try your Irish cream as I have not purchased it in recent years( too heavy with calories and guilt) Hoping your option will be a good one to share with the family on Christmas Day! Never making, no matter what…puff pastry (in the same vein, croissants), anything that involves shucking oysters myself and deep fried anything (not because it’s not delicious, but good heavens, the mess. And what are you supposed to do with the oil when you’re done? Too many logistical concerns!). Deb, I smoke my own pork belly. Granted I live in Idaho not NYC but it’s very easy and tastes great. Thanks for this recipe. I can’t wait to enjoy it. BTW, I can’t imagine something I refuse to make. Being retired I can spend as much time as I want to do whatever I want to do. Life is good. I will never ever make homemade marshmallows! You should make croissants! It’s SO easy, really. The only secret is to use good (European) butter and have some time to spare becasue the dough needs to rest between the foldings. But really, if you can master the Russian honey cake, croissants will be a piece of cake! My sister and I have been making this for years. We like the fact that there are no weird preservatives (or whatever) in it, and we can customize the flavor. My most recent was split in 2 – half with regular whiskey, and half with a spiced whiskey. Verrry tasty! I will never ever make sfogliatelle. I have made corn tortillas and croissants, and definitely agree with the majority that they are more trouble and expense than they are worth to make. You just can’t beat the expert specialists for those kinds of things (obv. cheese and wine as well). But my secret shame is that I am weirdly intimidated by cannoli. You guys, I am flying back to California for the holidays, and one of the things I’m most looking forward to is going to the local Italian bakery and buying a dozen cannoli, because I don’t have a good Italian bakery where I live. But I’m really averse to making them myself. I think it’s that you need a special mold AND you have to deep fry them AND you shouldn’t fill them ahead of time. Plus you should use sheep ricotta if you want it to taste right. But I know that plenty of home cooks make them. Maybe someday I will climb that Everest? Not to set you off but making yogurt is actually dead simple and reduces the cost of yogurt by a lot. The hardest part would probably be incubating the yogurt at the right temperature, but I have an instant pot which does all the work for me. A slow cooker could probably do the same. THANKS for the recipe! My boyfriend is Irish, so I can’t wait to test this out on him. I hate to admit it with being one of your fans, but I probably won’t make any of the “slaw” type cabbagey/brassica salads from this site (although I will continue to read about them). I just don’t like them enough for the trouble (I’ll do it when you decide to eat beets, okay? I like beets). I don’t have a food processor so that is part of the problem (the other is that I don’t like raw brassica). Probably won’t make sausage. I do make my own yogurt (it’s way cheaper) and have made my own strudel. I think this is a personal thing for each of us with the question that begs to be asked, “Is the mess/clean-up worth the product?”. I probably won’t make the Irish Cream either. But I must get a vicarious thrill out of reading about other people’s food adventures with these items, because here I am. You have almost convinced me to make candy. . . Regarding the croissants not to be made because then you would have 6?croissants around — I probably wouldn’t make croissants either (or kouing aman). BUT: You can freeze croissants and then reheat them. You just need to be careful about freezing (don’t put them in the self defrosting freezer or lose them for two years). You also have to use the oven for reheat. Does anyone have tips for making a lactose-free version of this? My mom became lactose intolerant a couple of years ago and she LOVES Bailey’s; I’d love to make it for her as a Christmas gift. sub coconut creamer for both milks: done. Love this recipe and it’s so apropos for the holiday season and gift giving! I remember this recipe in one of Maida’s cookbooks.. It’s just delicious! Four years ago there were a lot of things I would never have thought of making, but then I was diagnosed with coeliac disease and realised that there were a lot of things I’d never get to eat if I didn’t make them myself! Especially things with puff pastry, it’s hard to get a good gluten free one in the shops in the UK. Gefilte fish. I will NEVER make gefilte fish. This Irish Cream? Sure thing! I would never cook prime rib with Yorkshire pudding. Not too likely to eat it either. Well maybe just a taste. On to the homemade Bailey’s! Please. Jameson is rock bottom industrial Irish whiskey. Try Red Breast or Tyrconnell. Deb, you are once again my culinary hero! I am making chocolate chip cookie “shot glasses” for a holiday party and adding homemade Irish cream is the perfect addition! I’m pretty sure I’ll be making batches of this deliciousness all all holiday gatherings this year! Hehe, I think my face blew up and exploded just looking at this (dairy allergy), but I AM an alcoholic so I think I might have to whip up a vegan version soon. Normally I’d use Trader Joe’s vanilla almond beverage but soy milk would be creamier/possibly better for creaminess. Trader Joe’s makes another thing called “coconut creamer” that is genuinely decadent in terms of the cream mouthfeel so even though I doubt I could get a thickness going by whisking with non-dairy ingredients, I could still end up with a satisfying vegan rendition of your recipe. And yeah, cocoa with slight coffee flavor is the best. An Irish pub near me makes a really basic (dairy nightmare allergy) chocolate cake with coffee in the batter and in the icing and it’s so effing good. I’ve used this and disappointingly, it’s not quite cream. It’s like a thick glucose syrup, flavored with coconut, ie: kind of yucky, sadly. I think the “coconut creamer” from Jerusakem Cook above is a great idea! Question? If all I want is to take out the sugar (maybe replace with stevia, maybe not) and high fat dairy is ok, do I just add more heavy cream? Thanks! Would light cream be too thin? Love those little jars. I immediately tried to buy them but they are 😭 sadly unavailable. I don’t give up that easy though. I’ll be stalking for some! Made this Irish Cream last Christmas. Didn’t last long- too good. Try Mighty Nest. Type in “Weck” for the search term. Found them – 1.0 and 0.5 L sizes. I am SOOO excited about this. I too stopped drinking Bailey’s because I started finding it too sweet. I can’t wait to try it. I may even make some for my brother for Christmas, the lucky so-and-so. So the cream is preserved by the alcohol? This would be an occasional thing in our house…so, wondering about longevity. I guess we will be finding out! Any suggestions to replace the sweetened condensed milk? Sugar and more cream? Where did you buy those adorable carafes? Thank you; going to make some up for quick gifts! I found the jars (click in link, duh!). The taller jars, and a contoured version are still available but I love the clamp top, which are sold out. I made this today (and the horchata version, because ’tis the season) to give to the host tonight and it’s perfect. I’m saving half for myself (the horchata version is in.sane. So good. Thanks, Patsy!). This looks SO delicious! Definitely saving on pinterest! So this was fastest post – to kitchen – to mouth – Deb recipe to date. And I’ve been reading your blog for over 10 years! It tastes like the best boozy milkshake ever! Have you ever had bourbon cream? I had it at the Buffalo Trace distillery. I’m going to try this with bourbon instead of Irish whiskey and maybe minus the cocoa. Hmm might be delicious. Oh and I won’t make anything with shellfish. Besides having a terrible allergy they kind of creep me out – shrimp, crawfish etc. Look like aliens. I get sick thinking about boiling a live lobster. I heard they scream. Nope. That’s utterly terrifying. I was wondering if I could use bourbon instead so I’m excited to hear that you’ve had that and liked it! Also, I think I read that the lobster “screaming” is steam leaving the shell as it cooks. I’m still not about to boil a live creature, but at least it’s not actually screaming? I just made this with Buffalo Trace Bourbon instead of Irish whiskey! It was absolutely delicious! I did add about 1/4 tsp of almond extract but other then that I followed the recipe exactly. It’s almost the same as Buffalo Trace’s Bourbon Cream, the consistency is just a little thicker. I found some really cute bottles (like old milk bottles) at Hobby Lobby that were great to pour it in for gifts. Easy peasy. I just made this for a $20 secret santa swap party. Bed Bath & Beyond had a $6 stoppered glass bottle that this filled perfectly and a $14 insulated lunch bag to keep it cool under the tree. I’m hoping this is one of those presents that gets “stolen” multiple times. I will definitely be making another batch for myself- this is delicious! Not likely to make? Puff pastry or filo from scratch (though I’m happy to use pre-made for all sorts of things), cheese, sushi, and deep frying pretty much anything (from turkeys to tiny things I can’t think of). Most of this is more labor intensive than is worth the payoff or I can get something better if someone else makes it. For the frying, I just didn’t grow up with a lot of fried foods so my body rebels, and I hate the lingering smell in my house. I must make it tomorrow.Would make it right now, but I don’t have the wiskey ar hand.Tomorrow!!!! When I read your copy, I had the feeling you wanted to hear about foods we would not cook that are from your recipes. But after reading comments I figure I am wrong about that so I will just say I will not cook with arugula, radicchio, escarole, endive or dandelion greens because I hate anything that is bitter. I will not make recipes that end up with raw fish or snails. I do not like the texture of okra unless it is pickled and crisp and I will never cook gluten or dairy free (unless for someone else who needs me to do so). The number one recipe that I will not make of yours is this one because we do not drink alcohol and it seems a stretch to try to make this virgin! However, I do make all of our bread products to include grinding the wheat, yogurt, cottage cheese, bacon, sausage, corned beef. I also do a lot of canning, pickling, and preserving. Most things we eat are made from scratch by my husband or myself because we prefer it that way. I make all desserts we eat. Have a happy holiday, Deb and looking forward to many more delicious recipes in 2017! I chuckled in surprise when I read your hard limits: puff pastry, sushi, and yogurt… items I make on a regular basis in and out of my high school culinary class with my students (May I recommend rough puff pastry? It is so lovely and quick and puffs to a satisfying flaky crunch. My recipe is from the BBC but the Kitchn has a recipe that is similar.) My stops are just the opposite: pop tarts, goldfish crackers, rainbow cookies. My guess is that we lack the inspiration to improve a recipe because a little bit of the complicated food satisfies us but does not inspire a deeper exploration. We just didn’t find it delicious enough to fiddle with, nor are we compelled by necessity to ferret out a decent recipe. I started making yogurt when I needed to use a surplus of milk; we made puff pastry in class when the class budget could not afford 50 lbs of pastry sheets from a distributer. Oddly, I am traveling as I write this with a small cooler full of homemade Irish cream for the Oklahoma relatives. Now that is an item enjoyable enough to inspire multiple variations. Unsurprisingly, I liked every batch I made, my favorite being salted caramel made with a big dollop of goat”s milk caramel and Maldon salt. We must be on the same wave length. Wishing you and your family a happy holiday! What are the glasses you are using in the photo with the weck jars? I’ve been on a break with Bailey’s too, but this sounds amazing! Had no idea we could make this at home. No idea! I know a handful of people who would love to receive this. Thanks for the idea! Made this tonight as an end to dinner of Prime Rib and a potato galette, literally the best end of a meal ever. Wouldn’t change a thing. Thank you for another great recipe! Does ingredients count? Because I don’t think I’ll ever make my own phyllo dough. Getting something that thin in all the sheets necessary to do a good batch of baklava…. nope. Hey Deb do you think this would separate a bit in the fridge after a few days? I was worried too and it absolutely does not. Yay. Came across this around 2:30 a.m. when I couldn’t sleep and by 3:30 a.m. I was sitting down with a nice cup of coffee with Fireball Cream (didn’t have any Irish Whiskey)!! Absolutely brilliant. A keeper recipe for sure! I can think of plenty of things I will not make, happily purchasing them instead from a good purveyor. Croissants – NEVER. French bread — why bother — a good one from the French bakery costs $2. Any mile high dessert that has 18 different components/recipes – not gonna happen when a pint of Ben and Jerry’s is $5. This Bailey’s however — Deb, this looks and sounds spectacular! Just what I need! I made this for St. Patty’s Day and it was a huge hit. For Christmas this year we decided to try a Bourbon variation (espresso but no coco). It’s hard to tell which is better. In both instances our friends were delighted to receive small bottles as gifts! Ironically, I am totally all about making my own yogurt and sushi (veggie only as I am in freaakin’ Vermont), but draw the line at graham crackers and goldfish. I made it. I was the hit of the party last night when Coffee was served. I actually made this! But not on a hot rod, just as layers in a pan. Easier than it seems from the descriptions and wonderful to taste (you’re right about that). Oh, please do share the recipe if possible! I’d be so grateful! Hi Mardis(? ): Unfortunately I copied it from a book that a friend lent me a long time ago (and I don’t have the name of the book either). But from what I remember, the recipe just had you make the cake batter the way that it would be made on a rod. But instead of cooking it on the rod (which gives the tree ring appearance) you just pour thin layers into a cake pan and cook using the broiler (timing is essential here). I didn’t use a springform but did use one of the ones that has a swivel to release the cake (I think it is just called an “easy release” cake pan) with waxed paper underneath. So no special equipment, but you don’t get the tree rings, instead you just have flat “layers” that look very pretty. I think the frosting was quite simple as well. Later, I saw the rod method and realized how it worked, but it looked like a lot of trouble. The cake is wonderful though, whether made on a rod or by broiling. I know I wrote the recipe down somewhere, but this was at least 30 years ago. If I find it, I’ll get it to you. There was also a wonderful brownie type ganache filled cake that came from the same book. That was more trouble, but was the best chocolate dessert I’ve ever had. Ah memories. . . I made this last night for an office Secret Santa exchange…but when I took it out of the fridge this morning, it appeared to have solidified! Any ideas why? Or how I can fix it? Why fix it? Just scoop out with a spoon. . .
First comment to you after, ahem, years…yes years, of following religiously. 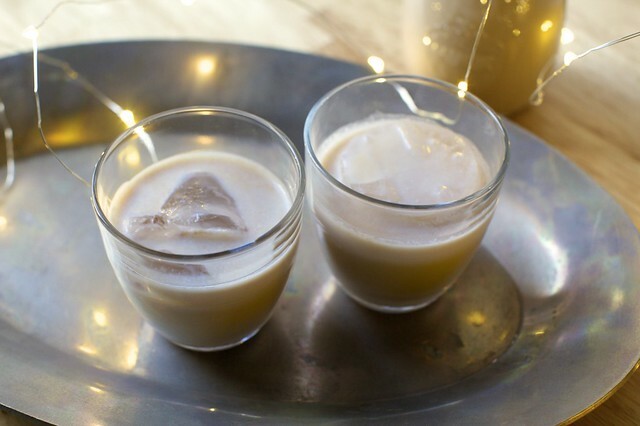 My husband doesn’t believe it’s Christmas until there is some Baileys (home made, this recipe, except there are some raw eggs in the one he uses) in the fridge. And just FYI, his family does the same, and I kid you not, they have had some ‘left over’ in the fridge for more than one YEAR and still drank it. And didn’t die. So….yeah, refridgerator shelf life of this stuff is likely forever. I highly recommend adding a little almond extract as well. People won’t expect it and it just ups the nuttiness and complements coffee so well. Or add some Frangelico…even better! True, we did this and it after mixing up the recipe and it was amazing with added Frangelico! Sadly, someone finished our Glenlivet. Any idea how this might taste with rum? I just made a batch with dark rum and it tastes great! Actually, it tastes pretty much exactly how I remember Bailey’s tasting when it was first launched in the UK in the mid-seventies when my mum came home with a bottle after going shopping one Saturday before Christmas. Probably twelve months to the day later, she bought another bottle and I remember it tasting quite different, nothing like as rich and decadent as it had done. That second bottle lasted a lot longer than the first. Just made this to give as a gift, going to need to make another batch for us to drink! So good and so super easy. Thank you! I don’t like fish or seafood at all, so that would probably top my list of things I’d never make. I’ve been making and giving homemade Irish Cream as a holiday gift for years. I originally found a very similar recipe (uses chocolate syrup, not cocoa powder), BUT something wasn’t quite right. That is until I added the slightest dash of both almond and coconut extract. BTW – I’ve been following your blog FOR YEARS, have your killer cookbook, and love your appearances on Leonard Lopate. Not a stalker, but a very big fan! I could do with one of those right now. It looks wonderful! I never thought you could do it at home too! I just made this, OMG! So delicious, I’m never buying Bailey’s again. Made this! Omg. It is delicious and has a wonderful kick! Than you. I’ll be making more! Oh. My. Goodness. This is delicious. We did a taste test with true Bailey’s and this was the winner. Made it as written and it is slightly less boozy than the original but the flavor is by far superior. Delicious over ice and in coffee. Thanks for yet another fabulous recipe! I’m definitely going to try this. Jameson here I come! Happy holidays everyone. I have memories of my grandmother pouring Irish Cream over vanilla ice cream for me as a child. Yes, I said it, “as a child!” Hey, she needed me to sleep and it was only a little. Sometimes it was Kahlua. Just a little. Made this yesterday kind of last-minute to take to a party, and so glad I did! It was a hit! A 4-cup pyrex measuring cup was just right for whisking it up. My cocoa powder (I used Trader Joe’s) didn’t give as much color as in the pics above and it had also settled to the bottom a little bit by today, so I will try a different brand next time. I feel dumb for not realizing Baileys had whiskey in it. I suppose thats likely what makes it “Irish.” I love Baileys, but wouldn’t say I am a fan of whiskey. Who knew!! My dad, husband, and every male member of my family love Baileys! What a great idea!!! I am tucking this one away for everything from the holidays to father’s days to birthdays! I used coconut extract instead of the vanilla ! So good ! Thanks for the recipe. I paid a ridiculous thirteen dollars once for a fresh pork jowl, and made my own guanciale. It hung, wrapped in cheesecloth, in my cellar for weeks. The carbonara I made was certainly delicious; nevertheless, I see no more pork jowls in my future. Every cook must learn her limits. Corned beef and cabbage- never gonna happen! 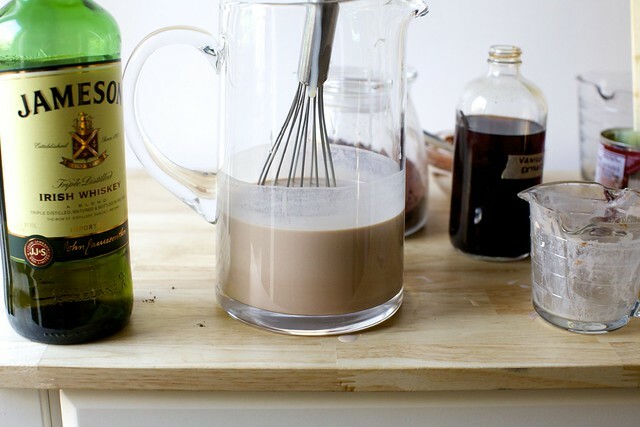 PS I’m super excited to make this Irish cream for my Mom; I don’t have any good ideas for her! I will probably never make croissants, and definitely not kouign amanns. I have tried macarons twice with less than average results (and much more frustration). I have tried corn tortillas (I’m a sucker, bought the press) and they tasted awful. Definitely NOT worth the trouble, however we do use the press for fried plantains, so I’ll call it a win. This recipe, with a little peppermint extract added, was a big hit at a holiday party! I didn’t have Irish whiskey on hand, so used a rye I happened to have on hand. It worked fine, especially with the peppermint forward flavors. I found the flavors merge and settle more when chilled overnight before serving. I once took a croissant making class and came home VERY inspired to make my own. That said, unless my life changes dramatically and I find myself with a lot of extra time and a Nancy Myers-esque kitchen, I will probably never follow through. Similarly, I’ll probably never make my own puff pastry or phyllo dough (as others have said). Or cure my own meat, though I have pork belly in the freezer, judging me. And when my boyfriend requested homemade cannoli the other evening (half in jest), I immediately thought of this thread and said “no way”. My mother has made them and futzing with dough, then getting it to fry around the molds and unmolding and cooling and filling… All work I will gladly leave to the professionals! There are few things I wouldn’t try once, given a friend with the right tools and the time to do it. At home, realistically, with only my own resources… I love good North Carolina pulled pork, but I’ll never smoke my own. Though I’ve helped someone else with theirs!! This was so delicious and easy( read strong) and so much better than the “real” thing! I used Jameson’s too, good choice, and the TJ’s organize sweetened condensed milk. I was very careful whisking and it looks smooth, but little tiny lumps of cocoa powder showed up. I put in the blender which helped a bit. Great gift idea! I also made peanut butter cups. So easy and again, so much better than Reese’s! May I suggest that you do this for Amarula liquor which is infinitely better than Baileys? Amarula is the bees knees. Discovered because elephants get wasted on the fruit? Please take my money. This recipe was a no-brainer and turned out perfect. I made a bunch to give to workmates…oct-tupled (is that even a word?) the recipe in a big pot. 12 gifts in 25 minutes, including tying a ribbon around the bottles. Thanks, this is a keeper. As far as things I won’t make myself…I agree with puff pastry and phyllo dough. Ain’t no one got time for that! For things I will never cook myself again, I tried a preparation of salt and pepper crab where you were supposed to pull apart a live Dungeness crab, quickly toss the body parts and legs in a salt/pepper mix, then cook by putting the pieces on top of rock salt that had been in a 500 deg oven. Now I knew the live crab would not like being ripped limb by limb, but I was unprepared for how long the dismembered parts would twitch. They also didn’t like being placed upon the hot rock salt and several pieces jumped off. Zombie crabs were out to get me! I ended up with clumps of undissolved cocoa floating in the liquid. Not very appetizing. The directions say to whisk the cocoa and a spoonful of cream into a paste in the bottom of the pitcher. I found this difficult to get a good whisking motion going within the confines of the cylindrical pitcher (partially because the neck of the pitcher is narrower than the base). You have a photo above showing whisking it in a bowl which I think would work better. Then transfer the paste into the pitcher for the rest of the stirring. Yes, I used a bowl for mixing. Much easier! The end product is very good, so give it another try sometime. anytime i use cocoa powder it always needs a good sifting to get out those pesky clumps before being incorporated into anything, so maybe doing this would help here too. I Can’t believe no one has mentioned how thick an rich this is. I just made a batch, and while delicious, it’s just too much. I think next time i’ll try it with half and half instead of the heavy cream. I would definitely use half and half!! Will never make again: wrappers for dumplings. What a pain, and they were terrible! Will never: corn my own brisket. A big hunk of brining beef in the fridge for a week sounds like a recipe for disaster. I don’t think I’ll ever make cured meat – like salami and bresaola – which require curing for months in the proverbial ‘cool, dry’ place and are then eaten raw. The idea terrifies me. Best left to the professionals. A bit of brining and curing (for meat which will then go on to be cooked), such as corned beef (done that) is my limit. Here’s one like Patsy’s for coquito (a Puerto Rican eggnog, sorta): a can of each–coconut milk, coconut cream, evaporated milk and sweetened condensed milk, plus cinnamon and vanilla. Eggs and rum optional. De-lish! And I found a great use for my Rième sparkling lemonade glass bottle with stopper! I’m glad I cleaned it and saved it. Thanks for a wonderful recipe for this holiday season. Ahhh. I should have decanted! This is reason no. 379 why you are my go-to for all thinks culinary! Made this tonight for my adult kids for Christmas and THIS will be another ‘Mom is loved’ moment. So deceptively easy, using only the best vanilla, cocoa, and whiskey, and I. Less than five, a cheaper and MUCH more delicious version of the thick bottled product. Many thanks and kudos to your kitchen fairy skills! Croquembouche. The Italian tower of pastries. In my imagination, the pinnacle of pastries. Unfortunately, the terror of going through all the finicky work of making and filling all the pastries, and building the tower, only to have it taste less than amazing has always prevented me from trying. I WILL make Irish cream for Christmas, however! Croquembouche is definitely an item to buy from a good French baker! The first time I had one was in France when a friend’s grandma made one for his birthday party, and it was fabulous. Yum. The only time I’ve had Croquembouche was at a wedding approximately 18 years ago, and I still remember how amazing it tasted. And, we were all mad, because we each only got one puff! Left us wanting more, for sure! Oh my. I happened to have all the ingredients on hand so I whipped this up. It sounds so fancy to be able say that, but this was so easy. And when I tasted it? I promptly ran out to buy many many little jars and more ingredients. Guess what everyone is getting this year? PSA- St. Brenden’s Irish Cream is an Irish import that is not as sweet -less than 10g vs the over 20g in Bailey’s- and half the price to boot! Thanks, Deb. How did you know that Bailey’s is like crack for me? I’m never going to make mayo (Hellman’s, please), ketchup (Heinz all the way), mustard, cheese, sourdough bread (cannot keep a starter to save my life), bolognese sauce (made it once, never again, and there’s a great Italian joint near me), pretty much any dough I can’t make and knead in my Zo bread machine, anything that spends 3+ hours in the oven (way too hot here in FL), canned anything. Have you tried homemade mayo? It’s so worth the effort. Lush and creamy and soft and flavorful. I’d use it as moisturizer if I could. I used to be all Hellman’s all the time, but now I find it so thick and goopy. I can’t go back to it. I have tried it and liked it very much. The thing is, we don’t slather mayo on much, it’s mostly used for cooking and lasts a long time. We need the stabilizers to give us the shelf life. So it makes little sense to make it myself. I don’t drink, but I making this for a gift. I use Hershey’s Special Dark for my cocoa, does that work, or will I have to buy regular cocoa? Any kind of cocoa will work. Like everyone else, EUREKA, I’m never buying Bailey’s again. Period. Which makes me wonder what OTHER better-than-buying recipes you can conjure, Deb?! As far as what I won’t try… growing my own wheat to bake my own bread. Although I’ve gardened with someone who has (just to know how much wheat it takes to bake a loaf). So how much wheat does it take for one loaf? Vanilla extract. It’s going to ruin you. It’s also really hard not to take a deep inhale every time you see the bottle in the cabinet. Makes lovely gifts too! This might turn me into an alcoholic, it’s so easy and sooo good it’s not even fair. I did have some clumping cocoa powder problem despite stirring well with heavy cream before adding more cream, but straining it fixed the problem. Things I would never do: Limoncello/infused booze. Corned beef. Jerky. Croissants/puff pastry from scratch. Anything deep-fried, but that’s really for health reasons and because we get it everywhere living in the rural South. This, though… This I may try. I feel like the comments are already suffused with people saying “but it’s so easy!” But I feel compelled to say: infused booze is amazing and so easy – as is making a fruit liquor. Most just sit in a dark place and need a good shake every once in a while! Wild blueberries booze and sugar become a magical elixir by the time winter hits! Kind of off topic, but I see that at least a few people have commented that making corn tortillas was not worth it. Just wondering what type/brand you buy? The only ones available near me are so bad they are almost inedible. I’ve made them in the past (much better than store bought), but it is kind of a pain for not a huge payoff. I use corn tortillas for enchiladas (they seem to just taste wrong without it being corn). The general advice I’ve gotten in the past is to first see if there is a company that makes tortillas locally (generally easier to find in the Southwest/West US). Recently there has been a trend for many companies to make corn/wheat blend tortillas that are a bit more flexible and taste pretty good. I have used the “tortilla factory” ones and like the taste, but like many commercial tortillas, they are over-processed. I have been looking for a different source but haven’t found one. . . I have also made corn tortillas. I was talked out of buying a tortilla press because I do not need one more object in my kitchen. It was a pain to roll them by hand, especially to get them thin enough. But with the press (I have seen others use it), it’s insanely simple, which is how good Mexican restaurants have them fresh all night. Basically, if I were to make them again, I’d use a press or not bother. I remember a Mexican restaurant in San Francisco where, in the center of the restaurant, you could watch a woman making tortillas entirely by hand. No rolling pin. They were the best I’ve ever had. I don’t know about never make, but I can tell you in the never make AGAIN category – macarons. They are so labor-intensive, it’s just not worth it, when I can buy delicious and beautiful ones. This is so funny I was JUST thinking about making this last night. I saw a recipe and thought…hmm I wonder if it’s better than store-bought.. Now you’ve convinced me. It’s on. I also just bought rainbow sprinkles for your confetti cookies. ’tis the season n all that jazz! As for things I’ll never make…yogurt maybe? (though I make cheese) and duck confit. I meant I WANT to but I get exhausted just reading the recipe. Never happens. Though I try not to say never in this regard because I make all sorts of random things now that I was sure wouldn’t attempt years ago. I found myself making short grain rice flour at midnight to stock in my freezer for some Korean radish cakes. Time, experience (and the grocery store being out of it!) changes you. just saw this- I mean I trust David implicitly..so, it goes on the bucket list. Delicious!!! I am making this as well as your hot chocolate mix and homemade marshmallows to give as gifts to my friends this year. I have had your hot chocolate EVERY DAY since I first saw your post. Thank you for that. This is the first time I’ve commented, which is to bad, because you’ve been making my life tastier and easier for at least a year now! Thank you for giving me so many great meals and desserts. I made the Irish creme today and YUM. That said, as I was making it I realized I was using a heavy creme that says use by 12/29. I am curious if the alcohol likely acts as a persecutive or if I should adhere to that date as the “use by” for friends and family I am gifting this to, rather then the two weeks you mentioned in the recipe. I’m not sure if this is a weird problem or a stupid question, but I have no idea. How can I substitute condensed milk since we don’t have it in my country? You can make your own, here are a few recipe leads. It’s basically just milk and sugar, reduced until thick and syrupy. I made this with dark rum instead of whisky, and it was delicious. This will be a Christmas gift for family and friends. I did have to drink the remnants of my Fairytale of New York simple syrup so I had a clean bottle to make this, but it was for a good cause. Thanks, Deb, for another year of amazing recipes. This is my “go to” site whenever I want to try something new, and so many of your recipes are now my favorites. I finally bought a notebook with plastic sheet protectors so that I can store the printed versions of the recipes I use so often. I was shopping to make your Fudgy Bourbon Balls and you were right to note that it’s hard to find the chocolate wafers. Who knew? Obviously you! But … I used chocolate graham crackers, which I think would be available anywhere .. even in a store brand version. Thought you might pass this on to others. I find the chocolate wafers by the icecream toppings in our grocery…weird. But I’ve also used the chocolate graham crackers of Teddy Grahams cereal… both work well. That looks delicious. I’ve been making liqueurs for a few years now. So far: Meyer lemoncello, mandarincello, sambuca and ginger. These are great for adding a dash of powerful flavor to cocktails (especially the ginger one) or just for sipping neat. But hey, I just want to point out that making yogurt is super easy and way cheaper than buying it. Our gifted yogurt maker sat gathering dust for years until I finally got tired of paying $7 a quart for fancy Greek yogurt and I put it to use. I do it regularly now. Look into it, you don’t even need a dedicated yogurt maker, just something to maintain 110 degrees F for a few hours. I love making things from scratch, including yogurt. Homemade yogurt in sooo good! But last year, Santa got me a cheese making kit for Christmas and I thought “Why the hell would I make cheese? !” I will not be using that kit. So many of your recipes are now traditions, for birthdays, holidays, warm days, cold nights, time with friends, gifts…thank you! The fairy lights! Insider tip – hit up TJ’s or Marshall’s and score for under $8! Ordered my bottles and making tomorrow! I recently discovered Eagle Brand Dulce de Leche sweetened condensed milk; so have now made one batch of Irish Cream using that in place of the regular Eagle Brand milk. I can’t actually say which version I like better, as both are quite delicious. Thank you for this recipe! I’m having fun making it as gifts and my grown kids will enjoy it soon, when they come HOME for Christmas! Merry Christmas! The line is there to be crossed :0 I made my own Baileys a while back and it was so freaking delish. Maybe I should make it again, like, now…. Thank you! I made it & loved it & shared its many. I also made it daily free using a can of evaporated coconut milk boiled down along with a cup of sugar (about 15 minutes and med high heat) creating a sweetened condensed milk and I used a can of coconut cream to substitute for the heavy cream. A slight coconut taste maybe but still. could you use bourbon instead of whiskey? that would be tasty right? I made a few batches yesterday for Christmas gifts. Thank you for the recipe! Made almost exactly as written — used 2/3 c cream and 1/3 c half and half. Then, to cut the sweetness a touch, I added an additional tablespoon each of half and half and whiskey. Holy hell, it’s good. Aw, nice. I didn’t know. Thanks for sharing. Just made this, and was as easy as you said! I did strain the mixture to get the larger cocoa bits that didn’t completely dissolve. I used about 1/4 cup whole milk to whisk the cocoa and another 1/4 cup at the end, just because I though it was a bit sweet, other than that, just as the recipe states. I found some adorable 8oz milk bottles with lids on Amazon at 6 fo $8.99 – they are from “dress my cupcake” if you want to check them out. Getting ready to bottle mine up! P.s. I doubled the recipe and it came to 7 cups. When I first mixed this up it was the perfect consistency, but after a few hours in the refrigerator it became really thick. The same thing happened to friends I shared the recipe with. Any idea why? Ours got thick in the fridge but by the time I gave it a little stir and poured it over ice, it was back to normal. Maybe seems thicker at the top? Or was it throughout and even when poured? Oh dear. Clearly evaporated milk is not the same as sweetened condensed milk…any ideas how to sweeten this batch up? Love this! But, no matter how careful I am with blending and making the paste, as soon as I pour in the whiskey the cocoa seems to separate back out. How can I avoid this? Thanks! Love your recipes! I stirred in all the condensed milk before adding the whisky, I don’t know if that would help? For the “never ever” make dish…let’s start with my location, I live at 6100 ft. Therefore, I will never, ever attempt a souffle at altitude. I just won’t even try. I don’t even think about it. Just not gonna happen! I think friends and family make fun of me, but in the winter especially, I check the barometer to see where the pressure is at. I never, ever bake here when a storm pushes through with a pressure drop, your oven will become possessed by evil cooking gods! Bad things will happen! That being said, living at altitude (grew up at sea level) has made me a much better cook/baker :) Happy Holidays! Are you sure that isn’t a tablespoon of cocoa powder instead of a teaspoon? With the teaspoon it never turned into a paste. I had the same problem! By the picture it looked like a tablespoon, so I cross referenced a few similar recipes and they used a tablespoon. I went with that instead and it turned out well…though imagine you could probably do with 2 tsp just fine. Going to try it with some almond extract in addition next time, or maybe scotch. Definitely a teaspoon and if the cream is added very slowly, it will thicken to a paste before it becomes liquefied. 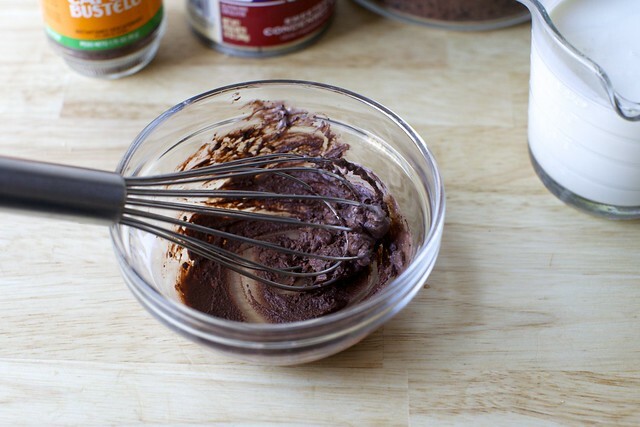 1 tablespoon makes it too chocolaty for my taste. This is so incredible! We made some for our early family Christmas and it was gone in seconds. I totally recommend making a double batch. It’s so darn easy and you will not regret it. So now we’re going to give it for gifts. Does this need to be refrigerated? Would be nice to tell the recipients. Perfect recipe timing! I’d been planning on making Irish Cream as a Christmas present and when your recipe popped up, it was fate! I threw everything in a blender because I 2.5ed the batch. I erred on the less-sweet more-booze size of things. Next time I would sub some half and half for the cream probably, but it’s great as-is. As for things I don’t want to make: Ice cream (extra appliance! and it never comes out as firm as I like), wonton wrappers, cannoli (though I love them) and specialty/extruded pastas. But I’ve also lived in places where certain foods are hard to come by, and desperate times lead to weird food experiments. For things I suggest people try- FLOUR TORTILLAS! Super, super easy (like any quick flatbread) and the benefit:extra work ratio against buying them is ridiculous. Way easier than making corn tortillas. The Pioneer Woman has a recipe I like (though I often use butter instead of lard or veg. oil). Oh yes! I’ve made both the spiced nuts and the Irish cream for gifts. Ready to go! Thanks for making it all so easy, Deb. I did modify just slightly with a bit of milk (less than a 1/4 cup perhaps?) to smooth the viscosity of cream. Perfect. Maybe a tablespoon or two less condensed milk next time…but really, beautifully balanced as written. Just made enough of this to fill six lovely Italian glass bottles. Oh my gosh, so freaking delicious, and easy as can be! Can’t wait to give them out on Christmas Eve. Such a great way to gift all my cousins a little sumthin’ sumthin’. Thank you for this wonderful idea and recipe! I just whipped this up as a Christmas gift for my Bailey’s loving husband. I only had a 1/2c of whiskey (how did I not realize I was running low!!) but it still tasted amazingly similar. No… Better! Fully recommended. Thanks for the recipe, Deb! This will absolutely be the star of Christmas Eve and Christmas Day! I used a heaping teaspoon of Penzeys Natural High Fat Cocoa (sifted) and Nielsen Massey vanilla bean paste. I was slightly short of Jameson (sob) because I bought one of the smallish flask size bottles of “only” (ha) 200mL, but I sure as anything can’t tell what’s missing! I might try this with whole milk instead of heavy cream next time as it is juuuust on the creamy side for me. I’m sure no one will complain. Things I will never make? Well I cook twice a year. Turkey dinner at Thanksgiving and Christmas. So pretty much anything is on the no cook list. Btw my dad made a bunch of different liqueurs years ago. In the 70’s and 80’s. All in the interest of saving money whilst being able to offer a drink to visitors. Needed a last minute, easy gift for a Christmas guest. Saw this recipe, sent boyfriend out to the store for Jameson, made it just now. Took ten minutes, and I tasted the mixture when it was done and went, “Wow, that’s effin’ Bailey’s!” Boyfriend concurred. (Cooking with Jameson on Christmas Eve morning is kinda what we do.) Thanks Deb! This. Is. Insane. Oh my gosh… the yummiest thing I have ever tasted. Have bought empty beer/kombucha jars and am giving it away as gifts for the holidays. My new annual tradition for sure. Who needs egg nog??? I made this yesterday and took bottles as Christmas gifts. It was as easy to make and as delicious as promised. Lots of requests for the recipe! Thanks Deb, this was PERFECT! Made this using organic coconut creamer, (one vanilla, one original – so it would not be too sweet – in amounts equal to all the milks and creams in the recipe), the whisky and the cocoa powder and that’s it! And it was amazing. Have a home batch and already gifted another batch. Thanks! Oh I used table cream (18% milk fat) instead of whatever heavy cream is. Worked great. I wouldn’t have wanted more fat than that in there. I read this even though I don’t drink alcohol just for your fun writing. For the record I mill my own flours, have for over 30 years, could not be easier and they are not rancid. This fall I made my own bacon from pork belly and smoked it for the first time. The hams are in the freezer waiting to be cured and smoked. I’d say sausage is the thing I just have not approached. Stuffing casings and all that. I am dreaming of setting up my attic for aging sausages and making my own prosciutto. This was amazing! A hit at Christmas. Next time I’m doubling it. Thank you for all the great recipes. Happy Holidays! It works out nicely to quadruple it which uses a full 1L bottle of Jamisons (1 Liter = 4.22 Cups), and a full quart of cream. You’ll want to anyway this is so delicious! Thought I would never do Ice Cream, but the Ice Cream attachment for the Kitchen Aid mixer is making that possible. No EXTRA appliance, no hassles, just a ton of yum. The liqueurs and boozy things you have given us over the years have been spot-on. I will never attempt Kimchi , but my daughter recently got a fermenting crock…and I gave her a fermenting cookbook, so maybe she will be the one to do it. I am an “older” cook, who lives alone, so my zany cooking days are behind me. Unless I have a huge gathering to eat all the fruits of my labors, I don’t experiment much anymore. Always still willing to eat though! Thanks for all you do to enrich our lives. As a Peace Corps volunteer I made my own tofu. While it wasn’t necessarily harder than making anything else in a context without electricity/labor-saving devices, it is definitely not worth the trouble now that I’m back to having both those things. It was interesting to play around with different acid coagulents (vinegar, lime, tamarind) and see how that changed the end flavor and texture– but again, not interesting enough to convince me to give two days and every pot in the kitchen over to it when I can buy excellent tofu elsewhere. Tried homemade pate de fruit two years ago – total disaster. Will not go there again. I made the Irish Cream to take to my parents from Christmas. It was a huge hit! Can’t wait to make it again. I’ve just made the third batch of Irish Cream this week…well, third and fourth as this was a double batch! We’ve never gone through a bottle of Jameson this quickly! Fantastic. Oh my stars. I did not need to know how delish and easy this is. There is no unknowing this. In forever changed. Love the small jars and carafes, not that any dressing up was required. Amazingly simple – must try! I won’t cook anything with octopus. They talk to me, unfortunately. On the other end of the dinner scale, I am totally intimidated with a rich pie crust when I look at all the fat ingredients. Otherwise, I’m all about using whatever I can from my pantry or buy whatever it takes to make dinner an experience and not just a meal. When I get a hankering for something, I’m all in! I agree about the octopus. Highly intelligent creature that even have a sense of humor. Thanks for the reminder. I’m new to your site… it’s beautiful! Loving it for when I need to indulge. Hmmm… wondering if you can put your own sweetener and not used the canned sugar milk… not sure what canned milk might have in it… and probably a lot more sugar (and the wrong kind?) than I would like. Just wondering if anyone has done it without the can? Ahhh… just saw that you posted a way to make your own sweetened condensed milk. May have to give it a try… especially because I can control the type and amount of sugar! Thanks! Sweetened condensed milk can be made at home; it’s just milk and sugar, cooked until thick and syrupy. If you make it at home, you can use less. Tamales. Because they are so time intensive, wreck the kitchen, and I can buy them here in South Texas from old (or young) Mexican women that have been making them from their grandmother’s grandmother’s recipe for years at around $9/dozen. where did you get those neat carafes, the ones with the lids? Right here, although they’re currently sold out. You might find them at the Weck online store; they ship quickly, although never for free. One doubled recipe filled two of these nicely. The neighbors seem appreciative. Amazing. Made this with my mom at 10 am yesterday and enjoyed some over ice immediately. Thank you. It’s perfect! Made this and it was lovely. The cocoa powder had seemed to have dissolved when I made it and I had also strained the mix before putting in into the bottle. After a day or so in the fridge, a little bit of the cocoa settled to the bottom. This did not affect the taste in any way, but I was wondering whether it would be ok to heat a spoonful or two of cream and dissolve the cocoa in it first and then cool it down and add the rest of the ingredients. Or would that affect the texture or shelf life or something else? After making my third batch this month I have found that using an immersion blender makes the mixture homogeneous and eliminates the cocoa powder sediment at the bottom of the jars. I blend 1/3 of the mixture at a time. Oh, using an immersion blender is a great idea! I’ll have to try next time. I love making things from scratch and this adds one more idea to my list! Making French toast with Irish cream sounds so delicious! Thanks for sharing! I am in love!! I was never a real Baileys fan, but my boyfriend wanted to make this for some cocktails he had planned, and now I can say I’m a card-carrying Baileys fan…homemade Baileys that is :) We followed the recipe exactly, and it turned out great. Wonderful for Irish coffee – though we do add a splash of extra whiskey. We’ve kept it for a smidge more than two weeks in the fridge, and it has held up wonderfully. Next year, I think we’ll be using this for homemade gifts! Love this idea! Found that homemade liqueurs are a very welcomed and enjoyed gift during holidays after my habanero limoncello was a hit! Going to try this winter! Never make from scratch- honestly I would like to learn to make everything from scratch and frustrates me when I cannot- have had some bad jam and jelly experiences and found that I HAD to follow directions- boo!! Would love to be able to ferment more and make a great farmers cheese from our dairy cows! This looks great! I won’t make croissants again. So much effort for a ncie treat but easier to buy. Just wanted to say hey Deb … you have an instant pot, you can make sushi!! I used this recipe: (https://feedyourskull.com/2016/03/16/ip-sushi-rice/) I use proper sushi rice and it sticks to the bottom for this recipe, but It makes a large batch of rice so burning the bottom doesn’t matter too much. At first, it looks way too shiny and gloopy, but put it in a wooden or glass bowl and use a fan to fan it while you stir to cool it and give that glossy look. you don’t have to roll it, just make little balls of it with wet fingers, the top with salmon or make tamago (omelette) to go with it (my son’s favorite) and it’s the best sushi ever, not too hard or time-consuming. Or toast up some nori, put cling film on a sushi matt, fill with salmon or tamago and sliced avocado and cucumber and roll it up. Then I eat the chewy rice stuck to the bottom of the bowl. This is now a staple in our house thanks to Instant pot. Mixed this up, with the coffee and a touch heavy on Jameson, to have on hand during the holiday week. It took 5 minutes to pull it together tops, well worth the payoff! We mostly consumed it in mid-afternoon coffee, but also delicious in very small quantities on its own. Would be good with cinnamon. I’ve never made lox but would love a foolproof recipe to try! And I’d never make pate again! Turned out awful! Bought the pig stomach lining used to encase the pate when cooking (as unappetizing as it sounds) and everything. Thank you for this recipe! I enjoyed it over the holidays and it is just as good as store-bought. I can’t believe how easy it is to make. O.M.G! I just made this tonight and it is wonderful! I think it is better than the store-bought brand because you can play with the ratio. However, an inch in the top of a mug of coffee is absolutely 👌. Will very likely do it again, maybe using a tiny can of condensed milk instead of a regular one if I want to have it neat. making yoghurt is super easy actually! in india we make it at home all the time. Corning meat is super easy using Julia Child’s technique of putting meat, Kosher salt and herbs in large zip-lock type bag in refrigerator. I use 1/2 can of pickling spice for my corned beef. Turn it when you think of it, will be ready in 1-2 weeks, scrape off salt, rinse well, and simmer until tender. Steam cabbage in a little of the cooking water. I agree that corning meat in a supersaturated brine was a royal pain! But this way is a no brainier! Funny story about those carafes… I’d previously bought two of them at a local Meijer [a few dollars cheaper, FYI] to store chia and flax in the door of my fridge. Maybe once a month or so I would “window shop” in the canning/storage section of that store, thinking that I needed to get more of the carafes for things like wheat germ and such. When I finally decided to buy more *they no longer had lids on them*! We asked several employees, who obviously knew nothing about them. Weeks went by, and they still didn’t have lids. Turns out the lids were packaged separately from the bottles and someone had been throwing them away! o.0 So bizarre. In the photos, there is some coffee (instant expresso?) but I don’t see that in the recipe. I just made this tonight because I happened to have all the ingredients on hand (well, didn’t have Irish whiskey, but I had Kentucky Bourbon). Absolutely delicious. I was tempted to add more cocoa since a teaspoon seems like such a paltry amount, but I was surprised at how much the chocolate hint came through in each sip. What a treat served over ice, and what a fabulous gift idea! Thank you! My girlfriend Clara and I both made this and it was delicious every time. But it always comes out better when she does it (no surprise). But now I want to make to make it for my mom and I would like it to come out better, so I was hoping someone might have some suggestions? Every time I make it, the cream and condensed milk separates from the rest as soon as I let to mixture sit for a bit. This happens when Clara makes it too, but not nearly as much. I thought the problem was that I wasn’t whisking enough, so I tried again with more whisking, but that didn’t solve the problem. Actually I ended up whipping the cream. Any advice? Since Clara makes it so successfully, I know the problem is with my execution, not the recipe, but I can’t tell what I am doing differently. Having made 3 consecutive batches, I found that dropping the sw. condensed milk in a bowl of hot water made a big difference. I did that on 2 of 3 batches & that 3rd one did not blend well. Still, not a bad idea to skate b4 using. I had the same problem. It tastes wonderful, but the consistency is clumpy cream. I think it’s because I used a VitaMix to combine everything after the cocoa/cream step. I’ll try again by hand. I’m going to try the Irish cream recipe as soon as I shop for the ingredients. Every recipe I’ve made has been amaze-balls and awesome-sauce. Even more fun is recreating each sublime dish with my friends. But this… THIS… Irish cream… OhMyGersh!!! I’m not even a drinker, and this was utterly mind-blowing as I tried to calculate how much time could minimally elapse before my first blackout. Way way way wayyyyyyyyy better than Bailey’s! My boyfriend was tempted to lick the pitcher after all his effort in whisking. Thank you!!!! Do not ever try to blend it. The cream separates. Gosh, I wish I had’ve attended that cooking with science many years ago! Try this in a glass with vanilla vodka and coffee ice cubes. YUMM!! Love Baileys but cant have caffeine it is in the store stuff. I can use decaf with this recipe! If you just want to add the flavor of Irish Cream to your coffee, you could buy the Bailey’s creamer, sold in the dairy case. It has no alcohol. I suppose if you wanted to sip it, you could cut it with a little water and milk. So, I’ve been eyeing the glassware you gave links for over a few months now – or, well, ever since you posted it, but you don’t indicate what kind of glasses the glasses are. I have a thing about glasses and how they are shaped and how they fit into the hand, and I’ve totally turned glasses over at restaurants to try and id them. these look truly perfect. so if you know what type they are and/or have a link, if you wouldn’t mind supplying it, please? thanks. These are Duralex Gigone. They come in 3 sizes, all fairly small, and this is the middle one, 5 3/4 ounces. Great for a petite glass of wine. I also have them in the 7 ounce (for a bigger one) and in the 3 1/2 ounce size (for a single espresso shot or basically the perfect cup for toddler hands). Thank you! I ordered a set of the medium to start. Check this thread for suggestions; it sounds like many people made it this way. And this! •	1 (14-ounce or 415 ml) can sweetened condensed milk (I use organic and think it really makes a difference). In the bottom of a pitcher, whisk cocoa powder and espresso and a spoonful of cream into a paste. Slowly, whisking the whole time, add more cream a spoonful at a time until the paste is smooth and loose enough that you can whisk the rest of the cream in larger splashes. Once all of the cream is in, whisk in condensed milk, whiskey and vanilla. Cover with lid or plastic wrap and keep in fridge. Enjoy! This recipe is awesome! I added just a wee bit of almond extract. Nummy! So please tell me more about tying things with these fairy lights … I followed your link but those lights are 16′ long! I love the idea, though. This recipe inspired me to make an amazing island-flavored vegan version that I’m calling coconut cream rum. I substituted cream of coconut for the sweetened condensed milk, coconut milk for the cream, and dark rum for the whiskey. (I included the cocoa powder, but I think I’ll try without it next time.) It was delicious! Believe it or not, you get a truer (is that a word) if you add 1/4 tsp coconut, and 1/4 tsp almond extract. I kid you not. Those can be adjusted to your taste. Mum has been making this for years at Christmas time. Always to great fanfare. Happy Christmas! Made a couple of recipes again today. This is oh, so good!! Looks beautiful in the “special” bottles as well. Thanks again!! Just got my copy of your latest book. I’m super excited to get started making the recipes. I so enjoyed your forward. Happy that you went ahead with this book. So many recipes from your first are favorites! Thanks!! Mine got really thick overnight. Any suggestions? Just give it a stir, should be fine. Pro-tips: use grolsch bottles because you can drink the grolsch first! Also, cheap whiskey tastes better and is easier on the wallet. Jameson deserves to be savored neat. Merry Christmas! How to make your boyfriend’s parents and adult siblings like you even more: make them this. Holy Moley this is the best and easiest Irish cream I have ever had!! Thank you!! So good. So, so good. I didn’t use quite all of the sweetened condensed milk, but used the recommended amount of everything else. “About three ingredients?” Are there too many to count? LOL. BTW, it seems there are five. Or about five. We decided to make our own Irish Cream for Christmas Eve, and we are so thrilled with the results! We made it without the addition of coffee, and it is amazing both in hot cocoa and all alone. This is a new favorite holiday treat! So here it is, Christmas Eve (late)….and I’M OUT OF BAILEY”S. But low & behold, I’ve the ingredients for this. Because breakfast is gonna be Boozy Baked French Toast https://smittenkitchen.com/2006/12/new-years-day-2001/ made w/ pannetone. Christmas morning is saved! I made four batches of this yesterday, it’s yummy, but didn’t see coffee granular in recipe….should I have included this? Nope, there isn’t coffee in the cream — it’s usually added *to* coffee. Enjoy it! This is absolutely delicious. I made it four days ago and my husband and I just polished it off. It’s great in hot chocolate! I just made another batch and I accidentally used one tablespoon of cocoa instead of one teaspoon. It was even better! Also, I’m far too lazy to do any whisking, so I made it in the Vitamix. I blended everything except the cream to make sure there weren’t any cocoa lumps, then added the cream for just a few seconds at the end. Making this was maybe the best choice I’ve made all year. This is one of my favorite things to make during the holiday season. I made it once or twice last year, and we’re already on our third iteration this year! I’ve found that using 1/2 and 1/2, or a mixture of 1/2 and 1/2 and heavy cream cuts down on the heaviness, making it easier to drink. Also, being a good Wisconsinite, I’ll often swap the whiskey for brandy. It’s much cheaper, and good whiskey should be saved for drinking straight! Can this be made with half & half, to lower fat content? Yes, and I actually think it’s better with 1/2 & 1/2. I made this today, wonderful recipe. Will absolutly make again in summer when I plan too whip it up in my blender with some coffee ice cubes! Yumm. I use chocolate syrup instead of cocoa (easier to mix in) and add a tablespoon of brown sugar and a 1/4 teaspoon of almond extract. This stuff is awesome. Corned beef and cabbage. Never. I literally laughed out loud when I tasted this, it’s so delicious. Holy sh*t! We didn’t have any whiskey, so I used bourbon, to no ill effect, apparently. I definitely need to try this!! Irish Cream is so good! I am looking for a recipe that doesn’t use chocolate sauce (because I don’t like the corn syrup and all the ingredients I can’t pronounce). I stumped on this and wondered, is it gritty at all? Please get back to me when you find time. Thanks! Not even a little bit! If you add the vanilla directly to the cocoa, you won’t get lumps. Even if you do get lumps (happened to me before I discovered this little trick), it still wouldn’t be gritty at all- very thick and creamy. I’ve made this a few times and it’s delicious. For the cocoa lumps, I’ve found that adding the vanilla directly to the cocoa really dissolves it. Not sure why it works so well, but it made it super smooth, then I slowly added in the cream. No lumps, you’re welcome. Also, I drank it after about 3-4 weeks in the fridge and it tasted and looked just as good as the first day. Now you’re talking…..! With winter coming up, this is on our festive menu at home now! Where is the actual recipe? Do you think you could make this dairy free with almond, coconut, or hemp milk? Probably, but you might miss some richness. See my tips here for more suggestions. Can’ go wrong. Every ingredient can be adjusted more or less to your taste. Sweetened condensed milk comes in the can so adjust everything else. I used good quality baking chocolate. I put some of the cream and half a square (.25 oz?) in a double boiler and whisked until well blended. Again more lr less to taste. Omg! This stuff is dangerously delicious! I purchased those beautiful gasketed juice jars in the 1/2 liter size, and the recipe filled a jar,and gave me an ample amount extra to sample. I already ordered some cute bottle tags, and I’m really excited to share these as gifts. Delicious, beautiful and homemade! We’re staying in this Christmas and needed something to sip on the couch while wearing our PJ’s. This was perfect. Added a splash of strong coffee on the second round. I can’t figure out why, but I have three cans of sweetened condensed milk in my cupboard. Now I know what to do with them. Cheers! Looks delicious in those adorable Weck jars. This is delicious. We like it over ice with a sprinkle of good quality sea salt. YUM. Great recipe! My neighbor introduced me to this a couple of years ago. Yum. I love how at the end you mention to serve in a tiny tumbler filled with ice..😁..ice in a tumbler yes, how tiny, I’m not so sure. 😁 I love seeing your posts. Your recipes are drool-worthy and your story telling makes me smile. Merry Christmas! I made this and the flavor is spot on but the texture is a little off. It got a little clumpy while sitting in the fridge. It didn’t curdle or anything, just seems like the cream separated. It was totally smooth when I made it. Any suggestions on what went wrong? I was at my local liquor store today for a 25% sale on spirits, and a saleswoman gave me a taste of an exceptional Irish cream that was NOT Baileys. Then we discovered it was not included in the sale so I left it for another day, just buying some excellent Irish whiskey among other things. Then I got home and thought, “heyyyyyyyy….. Wait a minute…..” Then I looked online and found this recipe. The one I tasted had no added favors (coffee, cocoa, etc) which was one of the selling points. So I’ll try your recipe but see what it’s like without those things. In fact, I’m wondering about the condensed milk, which has a flavor of its own. (Is that primarily to thicken it?) But you’ve inspired me to try something. Thanks.